The MX6600 hydraulic micromanipulator is the integrated version of our MX1600 series manual crossed roller bearing manipulator. This design integrates the metal bellow system with our precision crossed roller stage to ensure precision movement and long life. The fine positioning dials on three axes use our ultrafine 127TPI adjustment screws to enable 0.5 μm resolution. The coarse positioning knobs on four axes incorporate 20TPI screw drive positioning for smooth motion in the X, Y, Z, and Θ axes. The Θ axis can be adjusted to the desired angle of approach from 0° to 180°. The MX6600 has our MXC-45 mounted to the Θ axis. The MXC-45’s built-in rotational stop allows easy electrode/pipette replacement. MX6600s come standard with our ABP-R mounting plate. The design of this mounting plate enables coarse positioning between platform mounting holes as well as 360° of coarse rotational positioning. 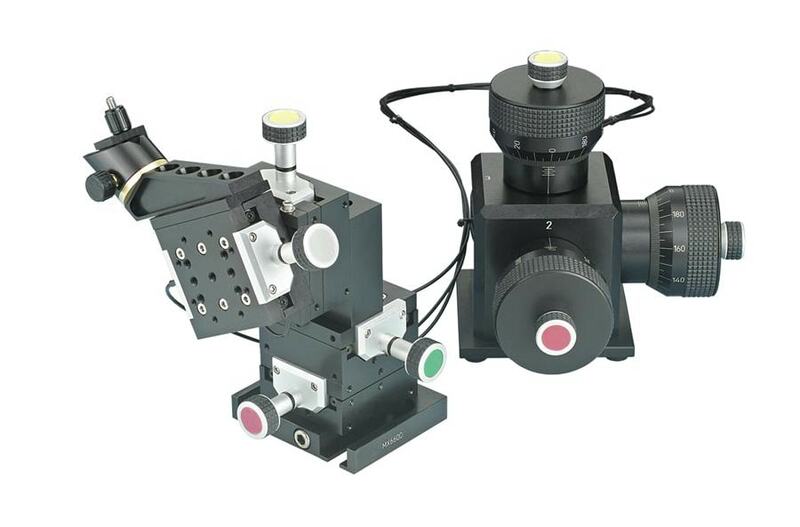 If rotation with a solid submicron level stop is required, the MX-RS rotation stage is designed to mount directly into the ABP-R as well as to the base of the MX6600.